The Bradco 485 Backhoe by Paladin Attachments increases utilization of skid steer loaders and tractors. At 925 lbs without a bucket, its compact size allows operators to easily move the unit around the jobsite and provides a maximum digging depth of 8 feet, 5 in. The full 180-degree dual-cylinder swing rotation provides equal power in both directions. A 10-ft, 7-in. horizontal reach from the swing post efficiently places dirt away from the digging area and minimizes the need to move the machine. The Bradco 485 Backhoe is compatible with bucket sizes from 10 in. up to 24 in. and heaped capacities that range from .92 up to 3.1 cu ft. 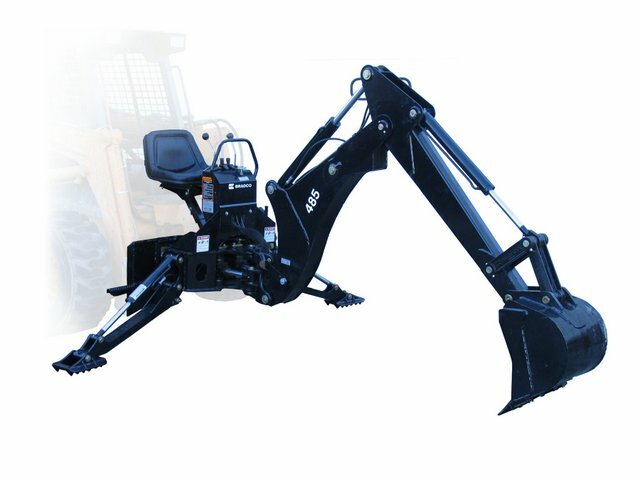 The Bradco 485 Backhoe’s SAE float detent in the boom circuit and circuit relief valve provide added protection and safety — allowing the operator to smoothly move from position to position without error. A high back adjustable seat and easy-to-use swing speed controls make for comfortable, yet precise bucket placement and digging. For more information about Paladin’s entire coupler and attachment offering, call 800-456-7100 or visit www.paladinattachments.com.